With the release of the Series 5 Update for Forza Horizon 4, developer Playground Games has revealed the full list of upcoming Car Pass rides and exclusive cars we can expect over the next four weeks of content drops. 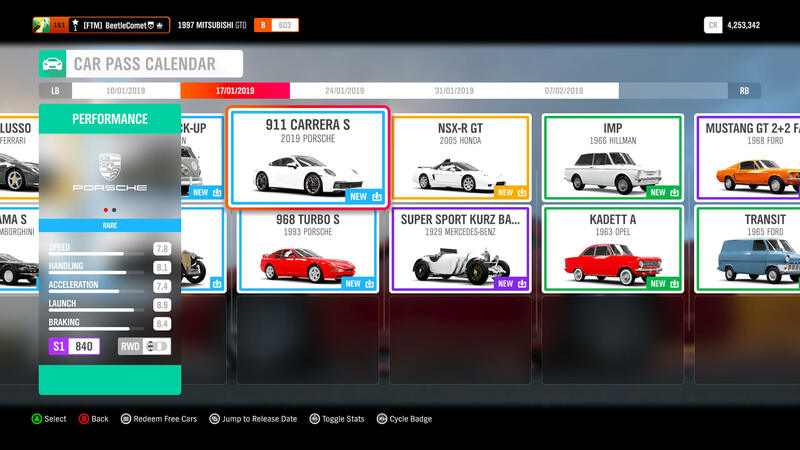 Since its release, Forza Horizon 4 Car Pass owners have received two new cars every week, an initiative that lasts for a period of 21 weeks to deliver a total of 42 brand-new automobiles into the game. The Series 5 Car Pass rides for Forza Horizon 4 are indisputably headlined by the 2019 Porsche Carrera S – the all-new 992 from the acclaimed German manufacturer. It’ll drop on Thursday, January 17th with another unmissable ride from the iconic automaker in the 1993 Porsche 968 Turbo S. These will be followed by a fan-favourite in the 2005 Honda NSX-R GT and the vintage 1929 Mercedes-Benz Super Sport Kurz Barker Roadster on January 24th. The last day of January will see the arrival of two motoring classics in the 1966 Hillman IMP and the 1963 Opel Kadett A – two sweet automobiles of decades past. Concluding the Car Pass rides for Series 5 are two iconic classics from America in the 1968 Ford Mustang GT 2+2 Fastback and the 1965 Ford Transit van – both of which will be available on February 7th. In addition to the above Car Pass rides, Forza Horizon 4 will also introduce a selection of new exclusive cars. These are available to all players at no monetary cost and can be acquired from either the Forzathon Shop or by completing designated seasonal events. They can also be purchased from the Auction House, usually at a high price tag due to their rarity, but they will also be added to wheelspins in the future. 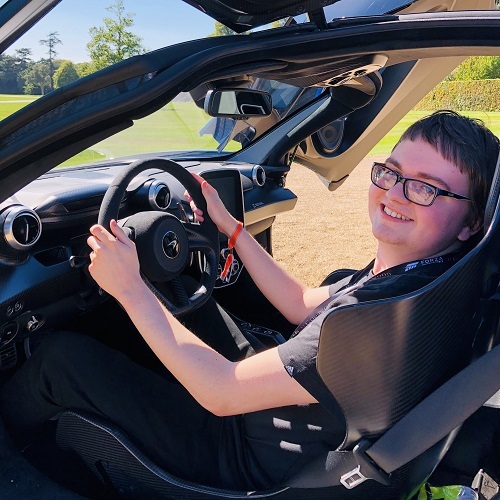 The exclusive cars for Series 5 include two additional Hot Wheels 50th Anniversary rides, with the Rip Rod becoming available in Summer and obtainable by winning one of the all-new Drag Racing Seasonal Championships, which arrived into Forza Horizon 4 with the latest content update. The second of these iconic Hot Wheels cars becomes available in Spring and it’s the 2005 Ford Mustang, which is adored for its ability in both racing and sliding sideways. The classic Mercedes-Benz 280SL will be obtainable in Autumn, whilst the Maserati Levante S will be unlockable during the Winter season. Across all four seasons, developer Playground Games will introduce 3 new seasonal events into Forza Horizon 4, including a new Trial event and a PR Stunt challenge. Some of the new Seasonal Championships will also include Drag Racing and player-created events using the Route Creator. In Series 6, this initiative will expand to include game modes like Infection, King and Flag Rush, as well as Street Races for those who enjoy racing their tuned-up automobiles in the utter darkness of night. 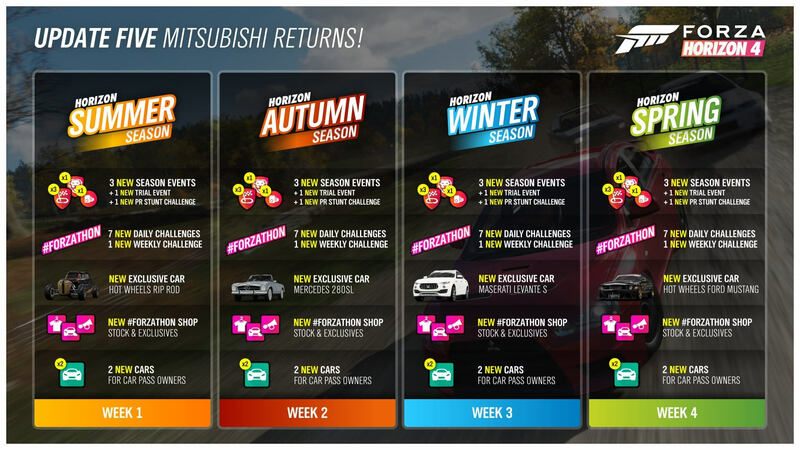 Forzathon will also continue throughout Series 5 with both weekly and daily challenges to complete, whilst the Car Pass rides mentioned above will also drop alongside the seasonal changes. Of course, if you’re looking for even more cars to add to your collection in Forza Horizon 4, then you’ll be pleased to hear about the return of a Japanese automotive icon – a pure legend in street racing and the tuning scene. We’re talking about none other than Mitsubishi. Seven beloved rides from the Japanese manufacturer can be acquired today in Forza Horizon 4 with the free Mitsubishi Motors Car Pack, available for everyone to download. 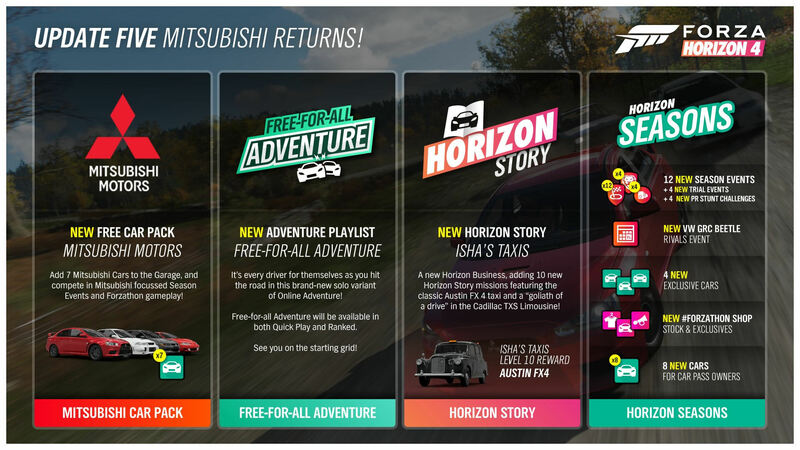 In addition, the Series 5 Update for Forza Horizon 4 includes a new Horizon Story in Isha’s Taxis and the arrival of a new ‘Free-for-All Adventure’ mode. Both are available at no cost to all players, with Isha’s Taxis offering the Austin FX4 London Taxi as a bonus ride if you haven’t been able to acquire it already from wheelspins. Keep in mind, this business costs 100,000 credits to start up, but you’ll earn daily login bonuses based on the number of stars you’ve accumulated from its associated missions. Be sure to check it out today and don’t forget to log back into Forza Horizon 4 every week for the latest seasonal content and of course, the freshest rides available to drive from the Car Pass.